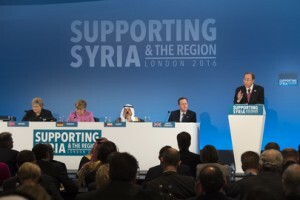 UNITED NATIONS, Feb 4 2016 (IPS) - More than $10 billion were pledged as humanitarian aid for war-ravaged Syria at the fourth international donor conference in London. In his opening remarks Thursday, UN Secretary-General Ban Ki-moon was implicitly critical of the international community for its failure to end the Syrian conflict, which has entered its sixth year. Urging all participants to increase funds, he said “the situation is not sustainable. We cannot go on like this. There is no military solution. Only political dialogue, inclusive political dialogue, will rescue the Syrian people from their intolerable suffering,” he said. World leaders, including heads of state and heads of government from the UK, Germany, Kuwait, Norway, Jordan, along with leaders of about 70 other delegations, pledged over $10 billion — more than twice as much as last year’s $3.8 billion in pledges at the donor conference in Kuwait. “Today’s pledges” – remarked Ban – “will enable humanitarian workers to continue reaching millions of people with life-saving aid,” alleviating the horrendous suffering of Syrian refugees by helping children to get back to school, designing employment programmes and re-building infrastructure, Ban added. Secretary-General Ban Ki-moon (top right) addresses the donors conference entitled “Supporting Syria and the Region” in London. Hosted by the United Kingdom, Germany, Norway, Kuwait and the United Nations and building on previous conferences in Kuwait. However the issue is not only about financial commitments but also how best to efficiently and effectively deploy funds, explained Mercy Corps – one of the largest humanitarian organisations working inside Syria — and feeding more than 500,000 people each month in the Aleppo Governorate. Simon O’Connell, Mercy Corps Executive director, said leaders should allow “Syrians and host communities (to) have maximum control over their own futures, by investing in small and medium entrerprises and enabling the creation of jobs. Mercy Corps, which was one of only two international organisations invited to the “Inside Syria” plenary session Thursday, said the recent bombings and the increased military offensive have forced around 21,000 people to flee towards the Turkish border. Future prospects seem dark unless something is done to stem the violence, Connell warned. Gordon Brown’s new 2016 “Marshall Plan” requires funds amounting about 1.5 billion pounds sterling (approx. $2.4 billion) in order to reduce the increasing level of child marriage, child labour and child trafficking in the region. 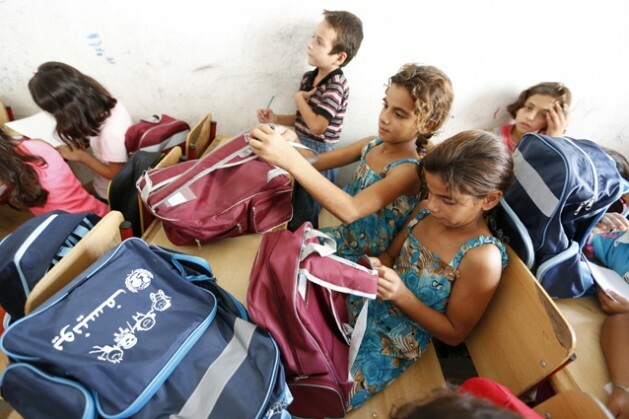 Providing schools in Turkey, Lebanon and Jordan will guarantee a future for both Syrian girls and boys and prevent internally displaced families from departing into unsafe journeys towards Europe, added the U.N. Special Envoy. “We have to find the £1.5 billion” – urged Brown. “To fully fund this welcome promise, and if bigger numbers of Syria’s 12 million displaced persons are not to head for Europe — and become not just a humanitarian problem but a security problem — we urgently need to collect funds and pin down the pledges to secure the one million plus additional school places promised,” Brown added.